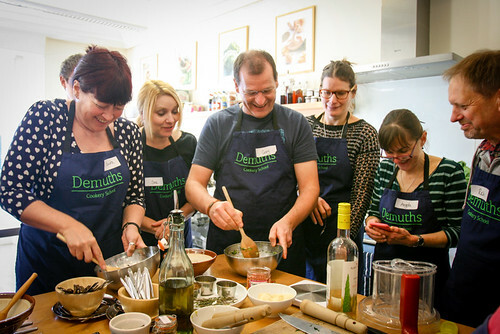 These festive bites were truly a highlight of our Vegan Christmas Cookery course 2014. Fun to make and even more enjoyable to eat! Fry the leek until soft in the olive oil along with the thyme, add the wine and cook until the mixture is dry. Wilt the spinach and squeeze the excess liquid out, then finely chop. Mix the spinach in with the chopped leek mixture. Roll out the puff pastry into a large rectangle, to 3mm thickness. 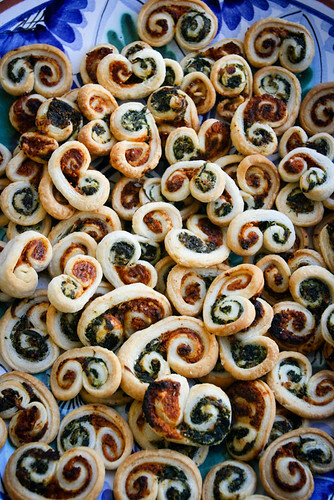 Spread the pesto over one half of the pastry and the leek and spinach mixture over the other half. Roll up the pastry from each side until the rolls meet in the middle. 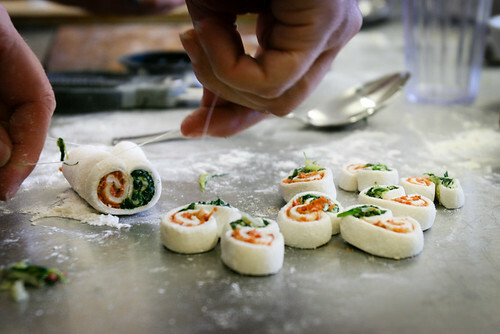 Cut the roll up into thin slices using fishing wire as a tool. Flatten each disc slightly onto baking parchment. Bake for 20 minutes at 200C/Gas6 until golden.